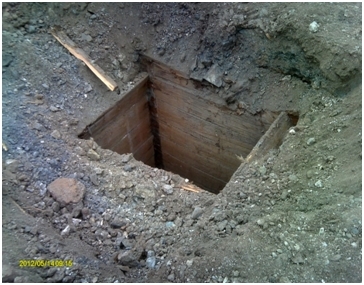 The discovery of this shaft within a residential development plot in West Cornwall certainly highlights the value of a carefully conducted mine search. Whilst in an area of historical mining activity, the historical archive plans available did not identify any shafts within the site. 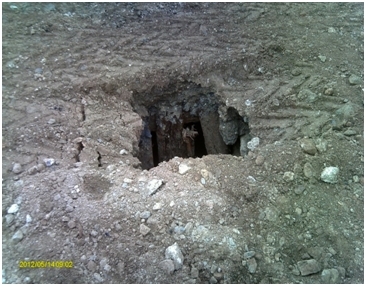 However, the presence of a mine burrow (waste tip) and other telltale mining features from the old maps provided clues. Interpretation by an experienced mining geologist suggested a likelihood of a shaft and its potential location. As is evident from the digger tyre tracks in the photograph, the search was certainly focused in the correct area! On further investigation using the correct end of the digger, a fine example of a timber lined shaft was unveiled which can now be remediated appropriately.